Wondering how fast does a Bullet travel? The mph speed of a bullet shooted from a gun or sniper rifle varies, as there are extremely diverse types of weapons available. Each gun is unique in its capabilities. Scientifically, a bullet fired from a gun is a projectile. It is often a pointed metal cylinder that is shot from a firearm. The bullet is usually part of an ammunition cartridge, the object that contains the bullet and that is inserted into the firearm. Cartridges are commonly called bullets. Bullet weights range from 115 to 147 gr (7.5 to 9.5 g). If we look at what material bullets are made of? there are a variety of materials. Lead or a lead alloy (typically containing antimony) is the traditional bullet core material. Traditional bullet jackets are made of copper or gilding metal, an alloy of copper and zinc. There are many other materials that are used in bullets today, including aluminum, bismuth, bronze, copper, plastics, rubber, steel, tin, and tungsten. A bullet maximum range, when fired out of a handgun, depends on the type of gun. A bullet shot out of a gun will eventually slow down due to the drag factor. The drag factor is due to the gradual accumulation of air resistance as the bullet loses momentum. The maximum range of a handgun is determined by the muzzle velocity, ballistic coefficient, and air temperature, amount of gunpowder, angle shot and form factor. Typically a 9 mm bullet shot out of a medium sized handgun will travel 2200 meters before it will fall to the ground. A bullet almost never travels this far before it actually hits something. So don’t test this theory because chances are you will shoot someone or break something. The bullet travels at 2,500 feet per second. If you reacted to the sound of the gun going off and required 0.20 seconds (twice that of the fastest Olympic sprinters) to react, then you would need to be at least 500 feet away to successfully dodge a bullet. The problem is that sound travels at 768 miles per hour (1,126 feet per second) about half the speed of the bullet. In this case, the bullet would hit you before you even heard the gunfire off. The longest sniper shot is credited to an unknown Canadian Soldier (name not disclosed for security reasons according to DailyMail). 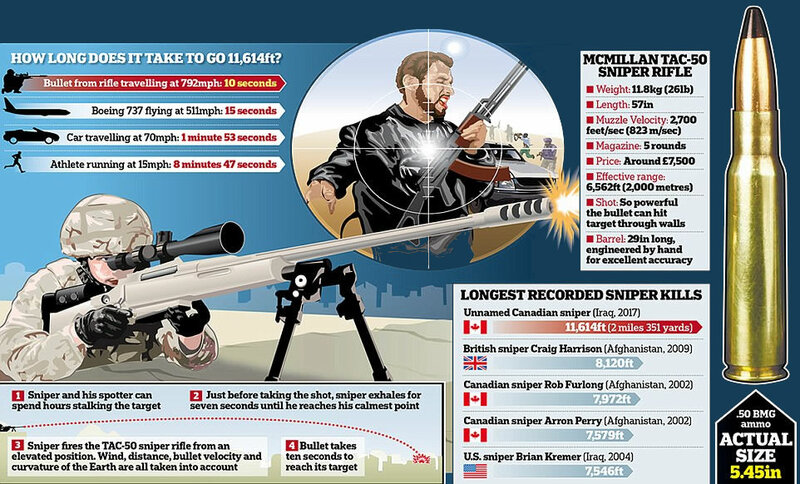 Using McMillan TAC-50 sniper rifle, he hit down an ISIS jihadi target 2.1 miles (11,614 feet) away. The bullet traveled for 10 seconds at speed of 792 mph to reach the target. The previous record holder was British Corporal Craig Harrison, who took down a target 1.5 miles away with his L115A3 long range rifle. The speed of a bullet depends largely on the gun from which it is fired, along with the intent of the user. When rifle bullets exit the barrel of a gun, they typically have an initial speed (called the muzzle velocity) that ranges from about 2000 km/h (1200 mph or 550 m/s) up to about 4500 km/h (2800 mph or 1250 m/s). If you put numbers like that into the equations, you’ll find a rifle bullet, fired at an angle of 45°, ought to travel about 100–150km (60–90 miles) from the gun. Of course, bullets don’t go that far: the maximum range might be up to about 4 km or 2.5 miles. Pistol bullets generally feature a lower acceleration than rifles or machine guns. Also, individuals involved with clandestine operations may use firearms with silencers, which suppress bullet speed and require special subsonic ammunition. The problem is that bullets go really fast. It means really fast. It is not safe to assume that the drag coefficient (C) is constant with speed. How fast does a Bullet travel in mph? The average bullet travels at 2,500 feet per second (around 1,700 mph). Something cool is that if you got a bullet going fast enough in a vacuum the size of earth and with the same gravity, (or just another planet with no atmosphere) it would never hit the ground because it was going over the curvature of the planet faster than it could drop. How fast does a 9mm Bullet travel? A 9mm bullet travels around 1500 ft/s. It will travel around 2500 yards before it. A 9mm bullet travels at approximately 682 miles per hour. It depends on several factors, but a good estimate is, about a mile. A 9 mm bullet will go 4000 feet and take 37 seconds to come back down. How fast does a Sniper Bullet travel? Sniper rifles generally project bullets at the same velocities employed by general-purpose firearms. However, they often use projectiles that are very aerodynamic, with particularly high ballistic coefficients. The muzzle flash often gives the sniper’s position away. There are devices that will suppress the muzzle flash and/or the sound, but they often limit a sniper rifle’s performance. A good sniper will probably be relocating, but that depends on his mission. In most scenarios the sniper is actually not that far away from you- 600-800 meters in most cases (1km plus shots are the exceptions, not the general rule) If you’ve decided that you can catch him without much risk to your force it is highly likely that you can catch him if you move fast. Unless the sniper has a motorbike or a vehicle on standby it is possible to catch him if you move fast, and have good troops. Move quickly, securing a line at least 300-400m out with bounding overwatch and your sniper will probably have to either go to ground or make a run for it. Keep going, moving your heavy weapon teams up as needed. Air surveillance here is useful to see anyone making a run for it. Of course, if you are in a jungle or a complicated city Street with lots of back alleys this may be a little complicated, but if you do it right sooner or later he needs to show him or risk being overrun at close range.